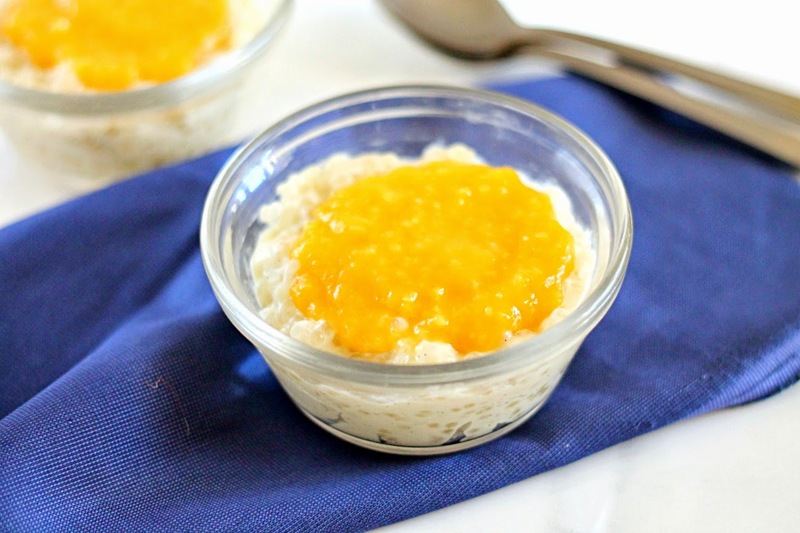 I had told you about this Coconut Tapioca Pudding with Mango a long time ago promising to share the recipe for it. Time just flew by and only recently did I realize that I hadn't shared the recipe. This was a delicious dessert I made using Grace Organic Coconut Milk. The picture doesn't do it justice. I found this a very difficult dessert to make look as good as it tastes. The pudding has a nice coconut flavour and is a bit grainy. It sets vey thick so I would suggest to put it in the serving cups when chilling. The mango was a nice contrast to the pudding but we thought the pudding was also delicious on its own. To make the pudding, soak the tapioca in a medium saucepan with the coconut milk and milk for 30 minutes. Whisk in the egg yolk, sugar, salt, seeds from the vanilla bean and it's pod. Heat the saucepan over medium heat until the mixture comes to simmer. Reduce heat to very low and cook until it thickens, about 15 minutes. Be sure to stir frequently. Consistency will be of a thick gravy. Pour into pudding cups and chill in the refrigerator overnight. To make the mango puree, process mango and sugar in a food processor until smooth. Refrigerate. Serve the pudding topped with the mango puree.